THE ROLLING STONES: the most iconic band in the world is a rock 'n' roll legend with an enormous following and Oscar-winning Director Martin Scorsese's unmissable film, Shine A Light, features Mick Jagger, Keith Richards, Charlie Watts and Ronnie Wood doing what they have always done best. The four band members sing and play with all the enthusiasm and enjoyment they had in their youth for this ultimate Rolling Stones film that will arrive on DVD on 3 November (2008) and they introduce three special guests: Jack White, Buddy Guy and the stunning Christina Aguilera. 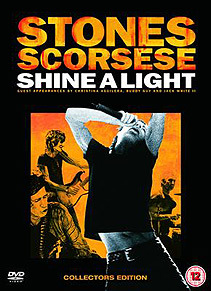 After months of planning, Martin Scorsese captured the magnificent performance of The Rolling Stones at The Beacon Theater in New York City for Shine A Light in the autumn of 2006. Scorsese (The Last Waltz) is no stranger to rock concert films and shot the Stones over a two-day period  the film includes archive footage of interviews during which a youthful Mick predicts he'll still be performing in his sixties! Shine A Light brings remarkable performances from the youthful Jack White, Christina Aguilera and Buddy Guy straight into your living room and interacting brilliantly with the impossibly energetic Rolling Stones. This DVD includes rarely-seen archival footage interspersed with the concert and behind-the-scenes eavesdropping as the planning goes on to film to perfection, informal chats between the band members as they work out their repertoire and Bill Clinton opening for the Stones! Mick, Keith, Charlie and Ronnie put themselves through an exhausting concert with Mick leaping around the stage as if he'd not aged one day since the Sixties. Among the early black-and-white images is Mick being asked in an interview if he'd still be performing at sixty  "Oh, easily, yeah"  and Charlie giving an interviewer a hard time. Beautifully shot, there are some lovely views over the city at night with magical lights and under Martin Scorsese's gifted direction, Shine A Light is a 'shining' example of a Rolling Stones concert on film and it comes together with apparent ease. The Rolling Stones line-up is: Mick Jagger on Vocals, Guitar and Harmonica; Keith Richards Guitar/Vocals; Charlie Watts on Drums; and Ronnie Wood on Guitar. Dedicated to the memory of the co-founder of Atlantic Records, Ahmet Erteg�n (31 July 1923 to 14 December 2006), Shine A Light also features Darryl Jones on Bass Guitar; Chuck Leavall on Keyboards; Bobby Keys on Saxophone; Bernard Fowler on Vocals; Lisa Fischer on Vocals; Blondie Chaplin on Vocals; Tim Ries on Saxophone and Keyboards; Kent Smith on Trumpet; and Michael Davis on Trombone. Director of Photography is Robert Richardson ASC.  Shine A Light from Twentieth Century Fox Home Entertainment is available to buy on DVD and Blu ray from 3 November (2008). Certificate: 12A. All versions contain extras which will give fans unparalleled access to the Stones, including four new songs exclusive to the DVD as well as an illuminating 15-minute behind-the-scenes featurette that includes rehearsal footage, candid moments with the band and rare archival footage. Both the Blu-ray and Collectors Edition formats of Shine A Light also include a second disc containing a digital copy of the film, enabling fans to experience this incredible Stones performance portably wherever they choose. Digital copy allows viewers to quickly and easily transfer a digital version of their DVD purchase to their Mac/PC computer, iPod or iPhone and watch superb quality digital video without the delays of downloading. In addition to the above, the exclusive limited Shine A Light Collectors Edition, also available from 3 November, will have its own unique numbered packaging, plus it comes with a sixteen-page collectable booklet of the movie's production notes. Shine A Light | RRP: �19.99. Special features  Four additional songs not seen in the cinema: Undercover Of The Night | Little T & A | I'm Free | Paint It Black. Multi-Angle: Jumpin' Jack Flash. Collectors Edition (RRP: �24.99)  Digital Copy | Production Notes Collectable Booklet | 15-minute backstage Featurette | Multi-Angle: Jumpin' Jack Flash only | Unique, highly-collectible packaging. Blu-ray (RRP: 24.99)  Special Features: Digital Copy. In addition to Multi-Angle with Jumpin' Jack Flash are All Down The Line | Some Girls | Far Away Eyes. Featurette: Connection | Back Of My Hand | Shine A Light | Tumblin' Dice | Wild Horses | Factory Girl | Only Found Out Yesterday (performed by Keith Richards). Bonus Songs: Under Cover Of The Night | Paint It Black | Little T & A; I'm Free. I Can't Be Satisfied | Under My Thumb | She Was Hot | Under My Thumb | Paint It Black | Nocturne Opus 32 No 1 | Drop Down Mama | Some Girls| You're A Fool To Cry| Honky Tonk Women| She Saw Me Coming| Champagne And Reefer| Arietta| Shine A Light | Jumpin' Jack Flash | Shattered | All Down The Line | Have You Seen Your Mother, Baby | Loving Cup | As Tears Go By | I'm Free | I Can't Get No Satisfaction | Just My Imagination Running Away With Me | Far Away Eyes | Champagne And Reefer (with Buddy Guy) | Tumblin' Dice | You Got The Silver | Connection | Sympathy For The Devil | Live With Me | Start Me Up | Brown Sugar | I Can't Get No Satisfaction | Exodus | Wild Horses | Only Found Out Yesterday.